In the case of those turntables having a split platter, such as certain of those from Linn, Roksan, AR, Thorens, etc., the inner platter or hub is usually slightly lower than the outer platter, often by 0.15mm or 0.3mm. So long as the inner underside ring of the Ringmat (Anniversary or XLR) still rests securely on the surface of the inner platter, even though it is very slightly lower than the outer platter, this should give an excellent result. However, should the difference between the inner and outer platters exceed 0.5mm, it will be best to build up the inner platter so that its surface is not more than, say, 0.3mm lower than the surface of the outer platter. For Roksan Xerxes and Garrard turntables, Ringmat Developments have developed special platter inserts for significantly improving sound quality when using the ANNIVERSARY or XLR Ringmats with these turntables. For use with Roksan Xerxes and similar platters, the lower section of the platter inserts comprises a 3mm foam rubber disc and the upper section a 1.6mm disc of neoprene foam sponge. Both discs have a diameter of 124mm and a centre hole of 4.5mm to go over the small 4mm Roksan spindle. To use the inserts, place the thicker 3mm insert over the spindle so that it rests in the centre of the inner platter/hub. Place the thinner 1.6mm insert on top of the thicker one. Although it is not possible to visually distinguish one side from the other, it may be found that the sonic performance of each insert is different according to which way up it is used. Accordingly, some experimentation may be worthwhile. 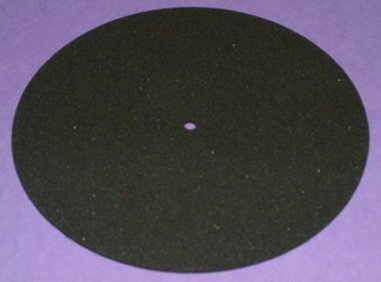 For use with Garrard 401 and similar platters, the platter insert comprises a single 1.6mm disc of neoprene foam sponge with a diameter of 124mm and a centre hole to go over a standard 7mm spindle. As in the case of the Roksan inserts, it may be found that the sonic performance of the Garrard insert varies according to which way up it is used. Accordingly, some experimentation may be worthwhile.